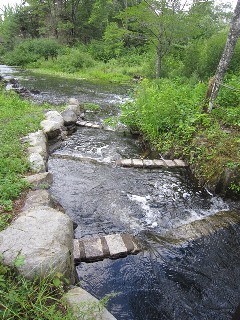 In this project, the Atlantic Salmon Federation Maine Council constructed a 17-step, rock and pool fishway and Denil fish ladder to restore fish passage around a historic dam on Blackman Stream in the Penobscot River watershed. The fishway bypassed the last remaining barrier in Blackman Stream and allowed restoration of alewives, American eel and sea lamprey into the watershed. Alewives have gained free access into Chemo Pond several miles above the stream. The fishway permanently reconnects the 1,223 acre Chemo Pond to the main stem of the Penobscot and to the Gulf of Maine, which complements the removal of dams on the main stem of the Penobscot River as part of the Penobscot River Restoration Project. Over time, the Maine Department of Marine Resources expects a return of 270,000 alewives to Chemo Pond. As alewife numbers increase with succeeding generations in Chemo Pond, this run has the potential to pour millions of juvenile alewives into the Penobscot River and Gulf of Maine. The mass migration in and out of this watershed will have tremendous benefits for Penobscot River and Penobscot Bay.